With the battle for the top-four tighter than a Darren Anderton hamstring, Tottenham need to pick up all three points at Stoke to keep their Champions League dreams alive. Following a 2-2 draw with Chelsea, Spurs find themselves in fifth place on 66 points; three points behind the Blues. North London rivals Arsenal are sandwiched between the pair on 67 points, and with only two games remaining there is still all to play for. However, there will be plenty of positives for the Lilywhites to take away from that draw after they showed great character to come from behind to level things up twice in the game. 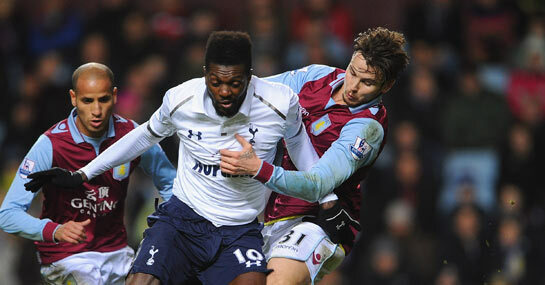 Perhaps most surprising was the performance of Emmanuel Adebayor. Often accused of looking lethargic this season, the Togolese striker recaptured some of the form that earned him a £25 million move from Arsenal to Manchester City four years ago. Travelling from well inside his own half, he strode forward with purpose before bending the ball from 25 yards out past a rooted Petr Cech. He then provided a slick back heel in the second half for Gylfi Sigurdsson to level it up again. Those who fancy Adebayor to strike again might be tempted by 6/1 for him to open the scoring this time. However, Spurs have not got the greatest record against Stoke, having failed to pick up a win in their last four matches against the Potters. Two of those clashes, including the last, finished 0-0 and it is 7/1 for that same result here. Furthermore, given that only one of the last four between these sides has finished with more than 2.5 goals scored, the under market at ¾looks a good bet. Following a 1-1 draw with Sunderland, Stoke now look relatively safe and would be unlucky to go down with 41 points. Relegation is still mathematically possible, and Tony Pulis will be keen to get a good result to take pressure of himself and his side. He will be hoping for a repeat performance of last year’s fixture at the Britannia which Stoke won 2-1, which is priced at 12/1.